The short answer is yes; dogs can eat squash! But, there are a few rules to keep in mind when it comes to feeding squash to your dog. Squash is a staple in most people’s diets, because of its versatility and of course, because of the different varieties we can choose from. It’s well-known for its nutritional value, including Vitamin A, C, K, as well as a ton of fiber. First of all, it’s best to offer your dog fresh squash, instead of from a can, frozen, etc. But make sure to cook it before giving to your dog. Raw squash (which is actually considered a fruit) can be tough to swallow and cooking make it easy to digest. Remove the skin and the seeds, which can actually be poisonous to a dog’s digestive system! Yellow squashes, such as spaghetti squash (a.k.a. vegetable spaghetti), is often used as a replacement for things like rice or pasta, and if you want to offer your dog a grain-free option, a bit of spaghetti squash added to their food is a great way to do so! It’s got a lot of beta-carotene, which is great for eyesight. Just make sure once you’ve ‘shredded’ the squash to look like spaghetti, your dog is only receiving a small portion in addition to their regular food. Acorn squash (pepper squash) is a common winter squash that can be roasted and is typically served with some kind of sweetener like brown sugar, etc. 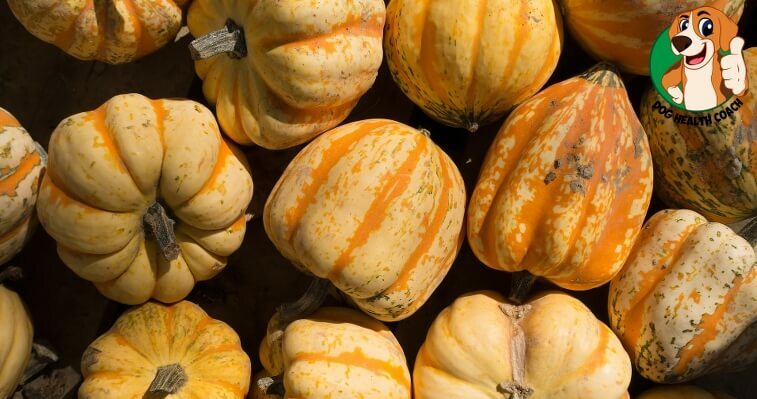 Also known as Des Moines squash, it can be just as healthy and enjoyable for dogs, but it’s important to stay away from adding any additional ingredients, sweeteners, etc. A few pieces of roasted acorn squash can be a great treat for your dog. Butternut squash is also called butternut pumpkin, and even ‘Batana’ in Sri Lanka, but it is undoubtedly one of the most popular types of winter squash. The best part about butternut squash? It offers a ton of nutritional value, along with a naturally sweet flavor. It can be roasted or boiled, and a few pieces can be served to your dog as a treat. However, again, make sure to remove the peel and the seeds. Butternut squash flesh can actually help with your dog’s overall digestion, but the seeds and skin can prohibit that. Does your dog enjoy eating squash? Wondering which other vegetables they might enjoy, and are totally safe? Check out our infographic of 55 human foods dogs can and cannot eat! Pumpkin squash seeds are healthy and a vermifuge for dogs. Why would squash seeds be different? Hi Linda! Thanks for dropping by. Squash and pumpkins belong to the gourd family, called Cucurbitaceae. The fruits are rich in essential nutrients including vitamin A and C, and phytochemicals. Cucurbita seeds contain cucurbitin (an amino acid), cucurmosin (a ribosome-inactivating protein), and cucurbitacin (a plant steroid). These substances are potentially toxic to mammals at certain amounts. Squash seeds can also possibly interfere in the passage and digestion of food in the gastrointestinal tract. A considerably large amount of seeds may also cause obstruction anywhere in the digestive tract. As for pumpkins, did you know that too much pumpkin can potentially harm your dog? The amount of pumpkin or pumpkin seeds that can be safely given to dogs has not been fully established. Take note that anything in excess can have a negative impact on the health and well-being of dogs. So always practice moderation and don’t forget to consult your vet if you give pumpkin fruit or seeds to your dog. Also, like squash seeds, pumpkin seeds can also become a choking hazard.